This October, like any other year, the Nobel Prize committee will announce the Nobel Prize winners. Odds are that among the Nobel Prize winners in science this year, like any other year, there would be a number of Americans, or at least those who live and do their research in the United States. Americans win the Nobel Prize so often recently that it’s interesting to see if it always was that way or if it’s a recent phenomena. 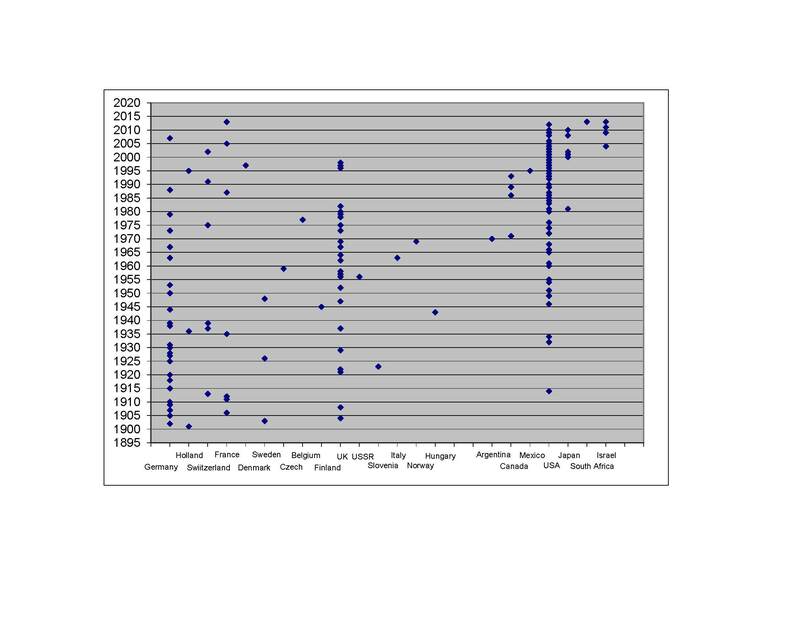 Here is a graphical representation of which countries have won the Nobel Prize in chemistry since the inception of the Prize until now. As the chart above shows, in the beginning of the 20th century the Germans clearly had the scientific edge. Add a few Swiss, a few Frenchmen, a couple of Swedes, a couple of Dutchmen, a Finn and a Slovenian, and it is clear that the European mainland dominated the field before the second world war. By mid-1930s only three non-European scientists won the prize, all Americans. By that time, the tender mercies of the German Nazi regime and the deprivations of the Second World War made many German and Jewish-German scientists decamp to the United States. However, England became the main beneficiary of the demise of German chemistry. From 1950 to 1980 UK scientists won the majority of the prizes although Americans began winning a large portion. Then, abruptly, it’s as if chemists in UK ran out of ideas or imagination. They also may have run out of money under the tight grip of the Iron Lady. Since 1980 the American dominance has been unchallenged. Add a few Canadians and a Mexican and North America now held sway. The US still holds the chemistry hegemony, although since 2000 a several Japanese and Israeli researchers began to take home prizes, although some of them got the prize for the work they did in the American Universities. Do the Japanese and Israeli wins portend an upcoming Asian dominance or simply a more even distribution of scientific achievement around the world? Interestingly enough, the American scientific dominance in chemistry did not translate into an industrial advantage. Despite the scientific dominance and despite the raw material and energy cost advantage Americans have had for most of the time since WWII, the European chemical industry taken overall is larger than the American one. Chemical industry is highly capital and technology-intensive. It isn’t very labor-intensive. Typically, labor averages less than 5% of the cost of production of most chemical products. With its emphasis on chemical, materials and mechanical technology and continuous necessity to maintain highly complicated equipment chemical industry is a good industry to have for our country. With the recent access to low cost feedstocks and energy from shale gas, the United States has a chance to build up its chemical industry. Once built a chemical plant will last at least 20-30 years, some lasting much longer, providing employment for a generation or two of highly paid, highly skilled employees. This is something that the American local as well as federal elected government must be interested in. However, there are many corporations, including the US Chamber of Commerce, who favor exporting the cheaper US natural gas in form of Liquified Natural Gas (or LNG) as a feedstock or fuel elsewhere rather than using it to create high-tech industry and high-value jobs in the United States. They state that the export of a natural resource brings better value to the US public than converting it into a higher value product domestically using high technology, high capital and creating many high-skill jobs. They also claim to have studies that support their point of view. Their studies may be correct, however, their results appear to contradict the experience of a number of countries, for example, many European countries; Japan and even Saudi Arabia and China who demonstrably prefer to convert their raw materials into higher value chemical, polymer and consumer products before exporting them. Could it be that in the last two decades, the US standards for safety and environmental protection have extended beyond those of other parts of the world? Higher standards increase capital cost, of course. It is likely perceived as the best long term strategy for the nation and the industry, but makes the US less price competitive in the short term. Higher capital costs in the US market also makes the industry more risk averse, avoiding investments that could potentially pay out nicely in the long term. I believe the US (or maybe I should say California) has the largest solar energy plant. Although only a fringe of the chemical industry, electric power generation and the technology it requires could be a niche market for growth. You bring up good points about environmental standards and capital availability/risk tolerance. I don’t know how these compare to the EU which has the largest chemical industry. I have a sense that the EU has higher capital availability and that the chemical industry there is dominated by very large companies so their risk tolerance for big capital investment may be higher, but I am not sure that is correct. Your article is really good to read. Excellent!! Thank you very much for sharing, I would like to post it on my Tumblr to share with my friends? Thank you, Terry. Sure, you can post it. Thanks for the heads-up. I’ll check it out.